It's important to have an experienced golfer who knows rules of play to keep score. The game of golf, as defined by the United States Golf Association, consists of hitting a golf ball with a golf club from the tee box into the cup. The player with the lowest score wins. According to Welsh golf, each golf course is given an overall par consisted to that course’s measurements and design. Although most courses’ par equals 72 strokes for 18 holes, some courses have par set a few strokes higher or lower. Your goal is to get the ball in the hole with the fewest strokes possible to equal or be under par for the course. Obtain a scorecard from the clubhouse when you pay your green fees. Notice the par assigned to each hole. Par equals the number of assigned strokes it should take from the tee box to the cup, based on the yardage and the design of the hole. Assign a "Marker" to record the score for each individual in your group, a member of your playing group or any other individual with your group, possibly a spectator. Although you may want to keep your own score, the Marker tracks each individual score for the group. Have the Marker list the names of each individual in your group on the scorecard. Hit your ball off the tee at the first hole. Count the number of strokes you take from the tee box until you sink the ball into the cup. Have the Marker record the number of strokes next to your name for that hole. Repeat this scoring method throughout the round. Count a stroke any time you swing the club at the ball without checking your swing, even if you missed the ball. Add a stroke to your score if you must take a drop. A drop occurs when your ball goes out-of-bounds, you hit into a water hazard or you lose your ball. The act of dropping a new golf ball into play counts as one stroke. Do not add a stroke for any ball hit into abnormal ground conditions. Casual water, drains, sprinkler valves and construction on the course are hazards that would not exist under normal playing conditions and moving or dropping the ball does not add a stroke to your score. Add the number of strokes taken for each hole together, for total number of strokes taken to play the course. 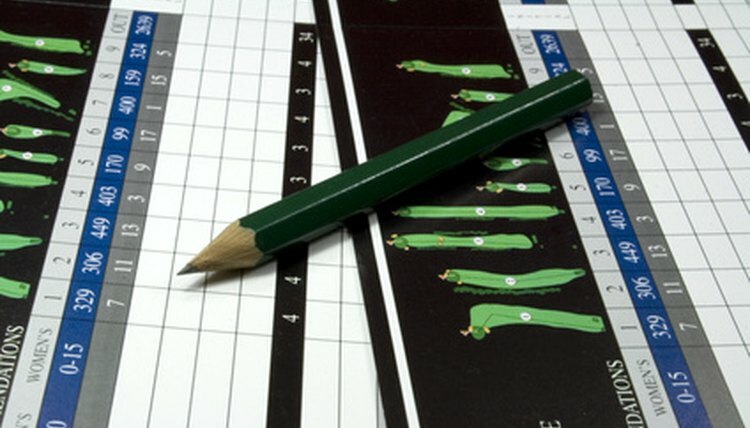 The marker checks with each player to confirm the score and each player signs the scorecard to verify the score. The player taking the least number of strokes to complete the round is declared the winner. Welsh Golf: Beginning Golf – How Should You Keep Score?